The grand-prize winning student team includes CEE Ph.D. students Haena Kim (third from left) and Ruimin Ke (fourth from left). It’s a race against time, although a race against dinner time might be more fitting. 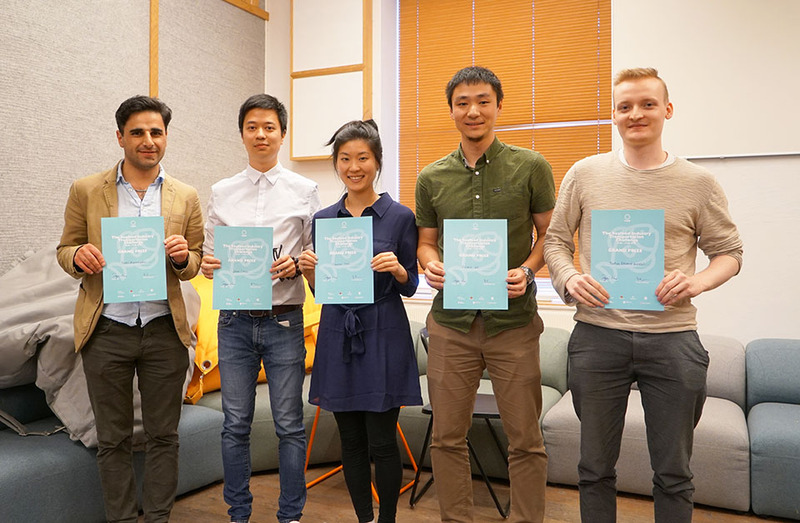 To devise innovative solutions for transporting fresh seafood from Norway to Asia within 36 hours, UW and Norwegian students worked together during the first annual Seafood Industry Transportation Challenge. 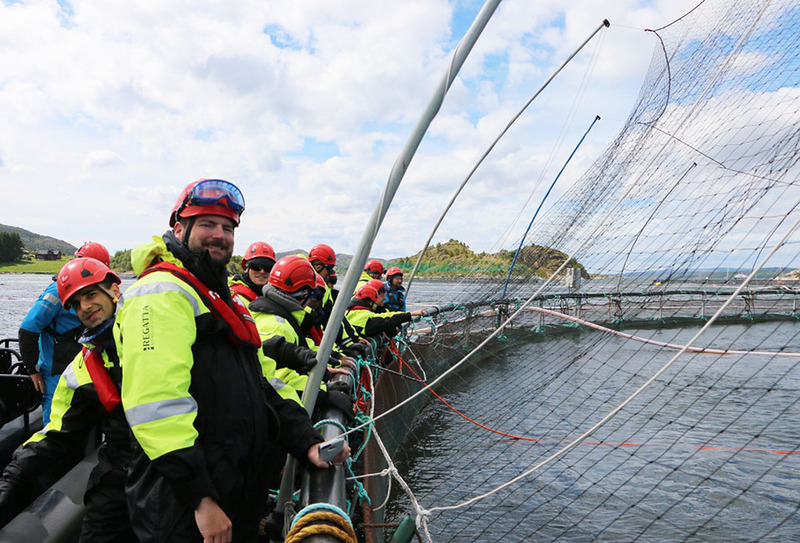 Students tour a fish farm in Norway. Photo credit: Ruimin Ke. The competition brought together 12 UW students and 20 students from the Norwegian University of Science and Technology (NTNU), where McCormack is an adjunct professor, and the University of Tromsø in mid-June 2018. 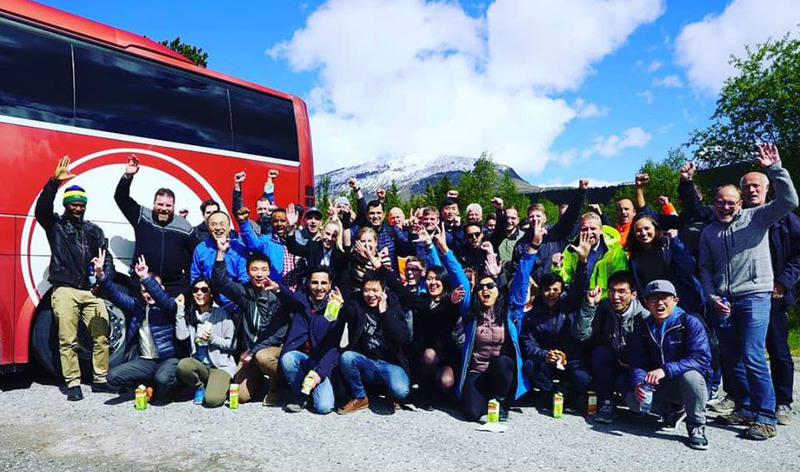 Together with faculty members, the students convened in northern Norway in Tromsø. 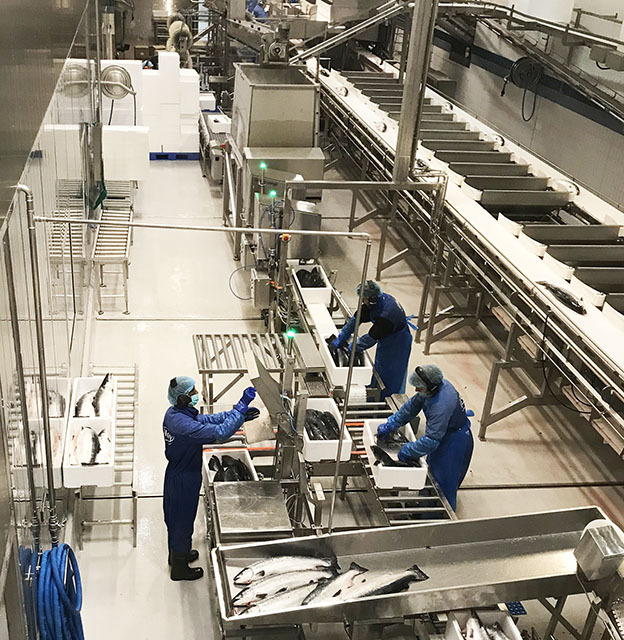 They quickly got to work, visiting fish packing plants, touring roadway corridors used by the seafood industry and learning about infrastructure challenges in the region. With fish becoming a staple on the dinner table, and essential for ever-popular sushi restaurants, fish farms are quickly expanding to keep up with demand. Salmon farming is one of Norway’s most important, and most profitable, food industries. It is critical, therefore, that fresh seafood arrive quickly at distant locations. Packed on ice, freshly harvested salmon travels 800 miles to Helsinki, Finland, where it is loaded onto airplanes and travels an additional 4,900 miles to Asia. “Fresh salmon is booming, so fish farms are booming,” McCormack said. While the fish packing facilities are modern and high-tech, efficiencies go downhill quickly once trucks leave the fish packing plants. 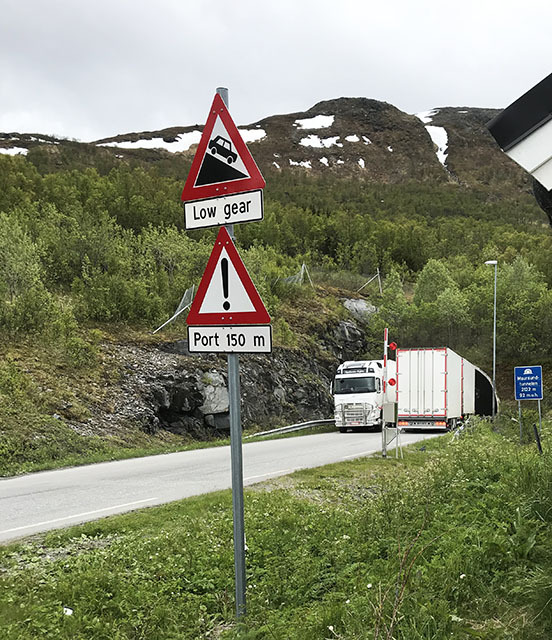 Not only are the roads narrow and windy in the rugged country, but there are numerous bottlenecks such as narrow tunnels and bridges, many of which can only accommodate one truck at a time. During the long, dark winter months, snow and ice also contributes to delays. New infrastructure is not feasible for the country, due to the high cost. A tunnel that can fit only one truck at a time. Photo credit: Ed McCormack. A fish packing plant in Skjervøy, which the students toured. Photo credit: Ed McCormack. After learning about the infrastructure challenges in Norway, the students headed to the NTNU campus in Trondheim where they spent several days working in cross-cultural teams. They developed solutions to improve the transportation of seafood based on two specific routes, one in arctic Norway and one in central Norway. 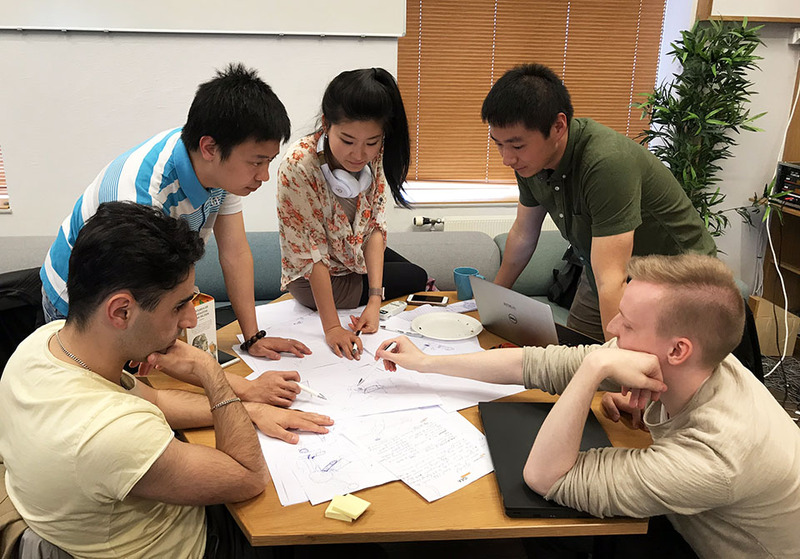 Advised by faculty members from both countries, including UW CEE professor Yinhai Wang and assistant professor Don MacKenzie, students were encouraged to creatively address the problem and involve technological innovation. On the last day, each team presented their solution. Students work on developing an innovative solution. The grand prize winning team included CEE Ph.D. students Haena Kim and Ruimin Ke. Their team proposed replacing human driving trucks with smaller electrical autonomous cars for fish delivery, which feature a novel loading and unloading system with a robot and conveyor belt for fish delivery. The cars would be pre-programmed to operate on difficult to navigate roads and would be prevented from entering tunnels if another car was already inside. “We conducted a thorough preliminary analysis on the system and demonstrated that it would be safer, greener, more efficient and more cost-effective than the old system,” Ke said. Students from the grand prize winning team, together with teams that took second and third place, will reconvene at UW in September. Together, they will work on developing feasible short-term and long-term solutions by combining the best attributes of each team’s designs. The idea for the competition emerged as a way to strengthen the relationship between NTNU, the University of Tromsø and UW, with faculty from all three universities involved in establishing the program. Bringing students together from different cultures resulted in better, more well-rounded solutions, McCormack said, as the students had different problem-solving perspectives that were influenced by their country of origin. “These differences resulted in both student groups blending their solutions. The Norwegian students brought esthetics and green perspectives to the project whereas the U.S. students had solutions that were more efficient from an engineering and logistics viewpoint,” McCormack said. The facilitators hope to build off the success of the inaugural program and offer additional transportation challenges in coming years. Program sponsors from UW CEE include the Supply Chain Transportation and Logistics (SCTL) program, Valle Scholarship and Scandinavian Exchange program and the Pacific Northwest Transportation Consortium (PacTrans). See for yourself what the first annual Seafood Industry Transportation Challenge entailed by watching the video. Group photo of students and faculty from UW and Norway. Photo credit: Engage-SFU.